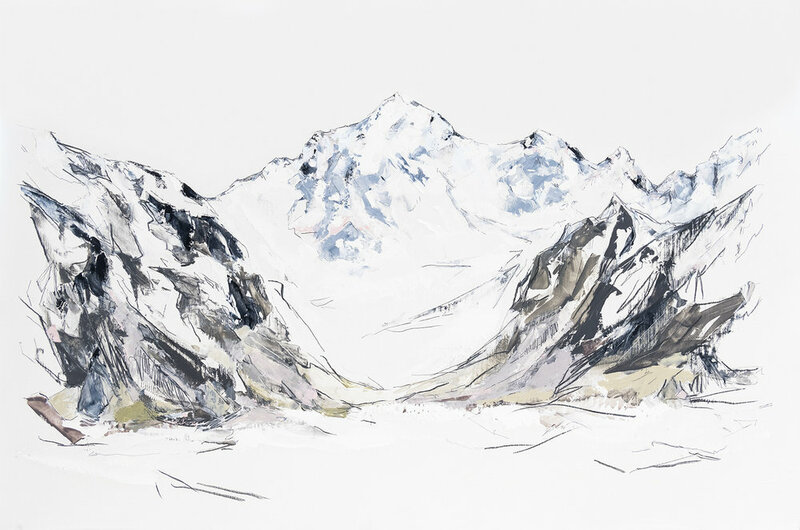 Mya Kerner, Oil and Graphite on Panel, 36 x 72 inches, 2017. Oil and graphite on panel, 40 x 60 inches, 2018. Mya Kerner, Oil and Graphite on Panel, 30 x 40 inches, 2017. Mya Kerner, Oil and Graphite on Panel, 48 x 72 inches, 2017. Mya Kerner, Oil and Graphite on Panel, 9 x 12 inches, 2017. Mya Kerner, Oil and Graphite on Panel, 24 x 36 inches, 2017. Mya Kerner, Oil and Graphite on Panel, 36 x 60 inches, 2017. Mya Kerner, Oil and Graphite on Panel, 12 x 18 inches, 2017. Mya Kerner, Oil and Graphite on Panel, 24 x 36 inches, 2017. In collaboration with Pacific Northwest Ballet. 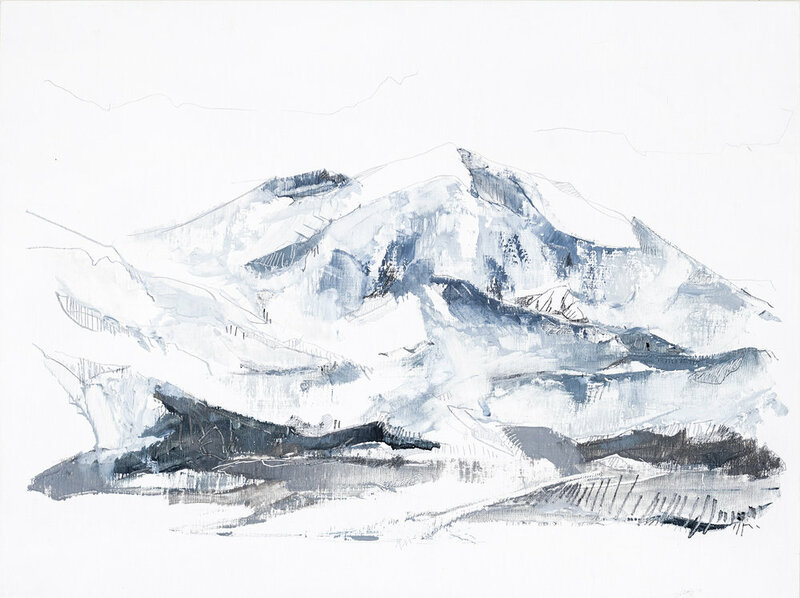 Mya Kerner, Oil and Graphite on Panel, 31 x 51 inches, 2017. Mya Kerner, Oil and Graphite on Panel, 36 x 48 inches, 2017. I regard the mountains as stoic icons reflected by mortality, records of the movements of the earth and the torrents of the sky. They represent a collision, or maybe, a collaboration of the elements and forces of life. Though continuously rising or falling, the mountains stand, silent, weighing on the shifting fragments of the earth, moving at an incomprehensible rate. In these works, I depict geological disruptions, carved moments and parts within the landscape. Records of denudation captivate me, as these notes present a segmented image of the whole. 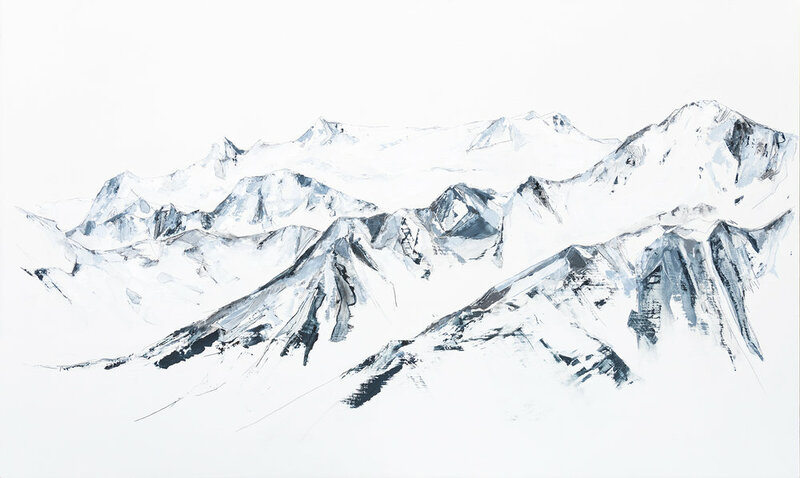 Mountaintops stand crisp against a stark white, reaching for an infinite sky. Descending are scratched lines, which break through the slopes, while flecks of white dapple eroded surfaces, recalling cooler seasons. These finished pieces linger on the threshold of completion, for what memory is complete upon its conception? The image often disintegrates as it nears the base of the painting, referencing the deposition of mountain and mythos. I approached these white panels with turbulent, yet restrained mark making. Mixing oil paint above and across graphite marks, I soften or exaggerate the contours of the landscape. In some areas, the imagery holds, stable, while across the scene, a moment of textural play denotes action, erosion or sliding, moving away from the sky, down to the chaotic base. My paintings depict the tranquility of nature, while whispering of unpredictability and grandeur far beyond human conception or control. As the threats of a changing climate are reawaken our terror of the Sublime, we fear the loss of human constructs within the false façade of permanence. We are reminded, to Nature, the individual is irrelevant, lost to the vastness and susceptible to the ephemerality of being.